Money gets a bad rap! The Bible is often misquoted as having said somewhere within its pages “money is the root of all evil.” But in fact – it doesn’t! The verse being misquoted is 1 Timothy 6:10, which says “For the LOVE of money is the root of all kinds of evil”. Money in itself is nothing more than paper an ink. It only becomes evil if we give it a higher priority in our lives than we give to God. Then it becomes an idol, and we develop greed. Out of greed come many evils. 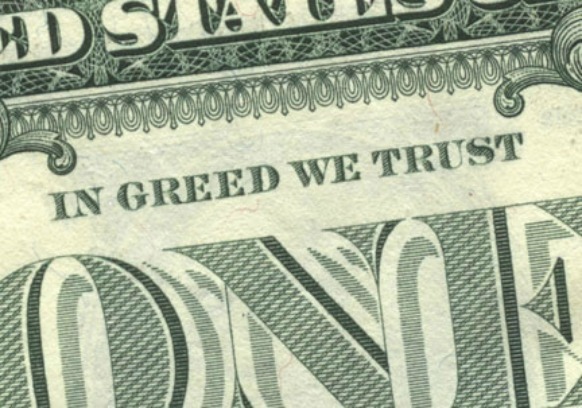 The problem with greed for money, wealth, or riches is a trust issue. When greed enters into our hearts, trust in God to sustain us and contentment leave. It’s ironic that all of our coins and bills have “In God We Trust” imprinted on them, yet we don’t seek God for our happiness, but money. We devalue His ability to sustain and care for us, as Jehovah Jirah, and choose to chase after wealth. We work longer than we should at our jobs for more money. We take on second jobs and side jobs for more money. We work during worship times to meet our “needs”. We buy bigger houses with mortgages that keep us up at night. We buy new cars that give us a ball-and-chain payment for six years or longer. And we do it all to please who? Do we really need bigger houses and new cars to be happy? Does it really flip a switch and raise your happy meter to have a new car and pay a $500 or more payment every month? Is that making you happy? Perhaps these are a means to something else we’re hoping to attain by having all these new treats and trinkets. Much of the time the true goal of our endless possessions is to please other people. It’s the “keeping up with the Jones’” syndrome. Yet, have you noticed that the Jones’ aren’t really interested in how much you have? Would it not be better to try to impress Almighty God than your next door neighbor? You can’t please people and God - pick ONE. In Matthew 6:24, Jesus says “No one can serve two masters, for either he will hate the one and love the other, or he will be devoted to the one and despise the other. YOU CANNOT SERVE GOD AND MONEY.” Yet, many of us live in such a ways as to profess that we believe Jesus got it all wrong! Our actions show our heart’s true belief, which is sometimes contrary to what we say we believe. We go in debt to own more, serving money as a slave to our credit card bills and payment books. But it only causes the happy meter to rise temporarily. We are never joyful and content! I love how Timothy explains it, when he says “Now godliness with contentment is GREAT GAIN. For we brought nothing into this world, and it is certain we can carry nothing out. And having food and clothing, with these WE SHALL BE CONTENT.” When we cannot be content with what we have, we forego the blessing of “great gain”. My husband shared a quote he saw yesterday that said, “Happiness will never come to those who don't appreciate what they already have”. Hebrews 13:5 parallels the issue of greed with trust in God. It says, “Let your conduct be without covetousness; be content with such things as you have. For He Himself has said, “I will never leave you nor forsake you.” Are not God’s provisions all that you truly need? Does He not, in all His wisdom, know how to give good gifts to you? Do you want to put your money to eternal use? Do you want to store up treasures in Heaven? Jesus told the rich young man in Matthew 19:21 “sell what you possess and give to the poor, and you will have treasure in heaven”. Would your money not be better invested in heaven that a bank earning 1 or 2% interest? Use it to feed the poor, clothe children, house the homeless, and support those that do these things. Giving KILLS greed. Greed is like a welcome mat set outside the door of your life for evil and unhappiness. God warns us not to chase after material things, but to build up our treasures in Heaven where “moth and rust do not destroy” (Matthew 6:19), and that “one's life does not consist in the abundance of his possessions” (Luke 12:15). But do we trust that His words are true? Do our actions show that we believe Him? True happiness lies in the Kingdom of God – serving Him. Luke 12:31 instructs us to “seek the kingdom of God, and all these things shall be added to you.” Live in the image in which you were created. Seek His righteousness, and all you need – you will have. Matthew 13:44 compares money to the Kingdom of God’s value as it says “The kingdom of heaven is like treasure hidden in a field, which a man found and covered up. Then IN HIS JOY he goes and sells ALL THAT HE HAS and buys that field.” It’s worth all the money! Are you seeking to attain the field, His righteousness, or are you seeking wealth? In Jesus name, dear friends, let this never be said of you.